Alarm and Event are both Notifier and are used to notify or inform about any important Alarm or event that has occurred or is occurring in present in an Industry. Alarm and Event plays a very important role in Automation Industry and this features should be in every SCADA Software. Every SCADA developer should keep in mind the importance of Alarm and events in there application. Every good SCADA Application should have Alarms which should show Present as well as Previous alarms history. subscribe to Automation-Talk by Email for more such articles on SCADA. 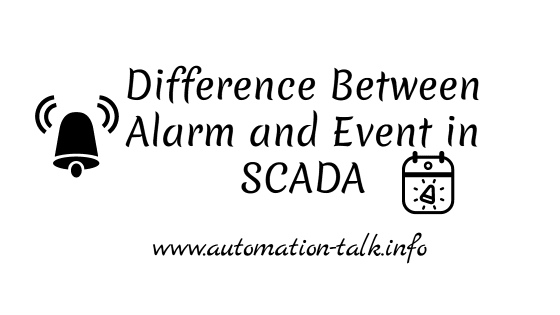 In this article we will just discuss about the difference between Alarm and Event in SCADA. 1. Alarm:- Alarms represent warnings of process conditions that could cause problems, and require an operator response. Example can be many, like suppose a Tank water level has increased beyond the desired value and that time SCADA system should give Alarm. The intention of an alarm is to signal that something has gone wrong, or that a particular stage of processing has been reached. For example, an alarm might indicate that a boiler has exceeded a safe temperature limit. 2. Event:- Events represent normal system status messages, and do not require an operator response. An event is defined as a detectable occurrence, which may or may not be associated with an alarm. Simple example of Event in Industrial automation can be simple logging of Operator with his user name to the SCADA application. The SCADA system can log that event in text file if configured to do so. If you like this article consider it sharing with your friends and like-us on Facebook too. Short and sweet article. Thanks a lot.